My maternal grandmother Mabel H. Jones, Dad, Albert D. Washington, who was a partner in Wash’s & Son’s Restaurant our family run business, and other items from my grandmother. In my family celebrating Christmas always signified a holiday rich with traditions, foods and rituals that bring up memories of my maternal grandmother, Mabel H. Jones. What I remember the most is her Sunday dinners and holiday meals of wonderful foods reserved for those special times of the year—with my family and close family friends—we delighted in sharing stories around the dining room table as we chowed down on scrumptious dishes and yummy desserts. 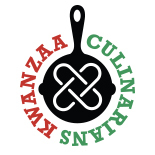 Today, many of the desserts my grandmother made are perfect for celebrating Kwanzaa with your family and friends. Sharing these delicate treats conjures visions of the aromatic smells and taste of cakes, pies, rolls and other sweets created in her kitchen. Thinking back something was always going in and out of the oven. If you ask what’s my favorite sweet treat, “I’d say, apple dumplings,” they warrant a five-star rating—gingerbread and cinnamon rolls closely follow in second place. Even though my grandmother labeled me a precocious child with wondering little hands and a proclivity for asking way too many questions that made people uncomfortable; she had enough patience to teach me how to bake when I was around eight years old. Watching her make dumplings was always delightful. Sitting at her kitchen table, my eyes followed every move as she made those sweet dumplings. When she turned her head, I would slyly poke the sliced apples coated with spices and sugar then lick my fingers. Looking at me out of the corner of her eyes, I would cover my mouth and giggle. Her dumplings always reminded me of small light brown crusty clumps, much like the velvety hanging purses she hid from me in dresser draws. Once the dumplings went into the oven, the entire house smelled of the delicate aroma of cinnamon, nutmeg and mace spices this soothing combination that tickled my nose. An enormous amount of time and craft goes into baking. 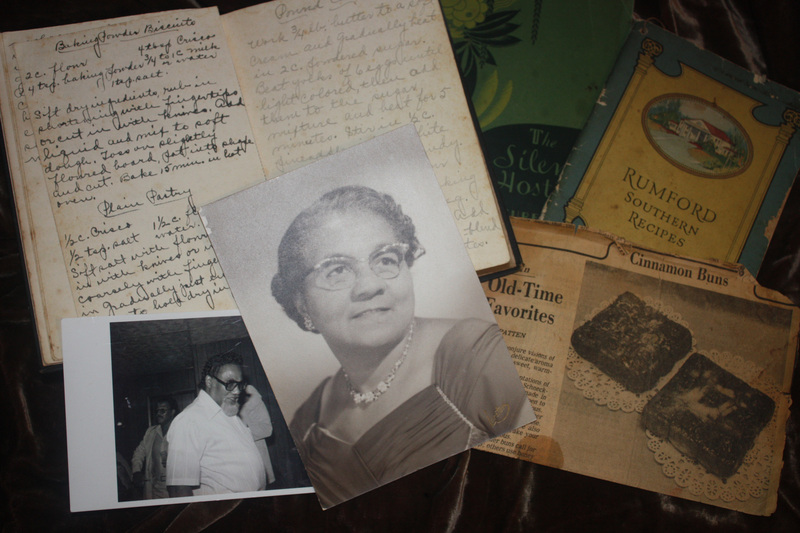 Many lessons were learned from my grandmother, from organizational skills; the importance of shopping for the freshest spices, vanilla flavorings, butter, eggs, and the best quality flour. And she made sure I knew how to read recipes, use the proper measuring cups for dry and wet ingredients—this improved my reading and math skills. The kitchen cabinets and drawers were brimming with an endless range of objects and tools used for whipping of those tasty delights. Stuffed inside were porous clay mixing bowls, different size spatulas and wooden spoons, more than one set of measuring cups and measuring spoons, plus a hand mixers and electric mixers. After my grandmother passed away in 1989, my mother gave me one of her small clay-mixing bowls, a few tattered notebook filled with handwritten recipes, recipe index cards, plus several beautiful decorative cooking pamphlets. The best gift was a lovely set of four-luster ware dessert plates the border trimmed in a small cerulean blue floral pattern. Those plates were strictly reserved for special occasions. Hanging out at the local cafes or teashops in my neighborhood and wandering the spice and nut aisles at Sahadi’s Market in Brooklyn, take me back in time to the aromatic smells of sweet treats that filled my grandmother’s house and those special holiday meals. I am a little bummed that many of the sweet treats she made are no longer sold today. To Make the dough: Sift together flour, sugar and salt and place in a large bowl. Using your fingertips or a pastry cutter, cut in the butter until you have a coarse meal with pea-sized clumps. Beat the yolks and water together in a small bowl and stir them into the flour mixture until well-combined. Add more ice water, 1 teaspoon at a time, as needed to form rough dough. Flour a board or work surface and turn the dough out. Sprinkle dough surface with flour and knead lightly until it is combined. This is only 5 or 6 kneads. Do not overwork dough. Form the dough in two balls, and then flatten into disks. Wrap with plastic wrap and refrigerate for at least one hour and up to two days. Meanwhile, Make the Filling: Place the apples in a large mixing bowl. In a smaller bowl combine the cinnamon, grated nutmeg, mace and turbinado sugar, and then sprinkle this mixture over the sliced apples in the bowl. Mix well to make sure the apple slices are all coated. Set aside and cover the bowl with a damp paper towel or kitchen dishtowel. Preheat the oven to 375°F. Remove the dough from the refrigerator and let sit for 10 minutes on the counter. Divide each dough disc into three equal sections. Working with one piece of dough at a time, place the dough on wax paper. Flour the dough surface and place another piece of wax paper on the top of it. Press down on the wax paper with the palm of your hand to flatten the dough between the two pieces. Using a rolling pin, roll over the dough to smoothly flatten into squares, roughly 8 inches by 8 inches. Divide the apple filling into six equal portions and place one portion in the middle of dough squares. Place 1 pat of butter on top. Apply egg wash to all edges, then fold up edges neatly and pinch together to form a pouch. Repeat until all the dough and the filling is used up. You will have 6 dumplings. Place the dumplings on a cookie sheet lined with parchment paper and place in the refrigerator for 15 minutes. Remove dumplings from the refrigerator and brush with milk. Bake for 45 minutes or until the crust is a golden brown. Remove from oven and cool one hour before serving. For a new twist, top with lemon curd sauce or a few scoops of homemade vanilla ice cream. Note: This recipe is featured in American I am Pass it Down Cookbook on page 211. 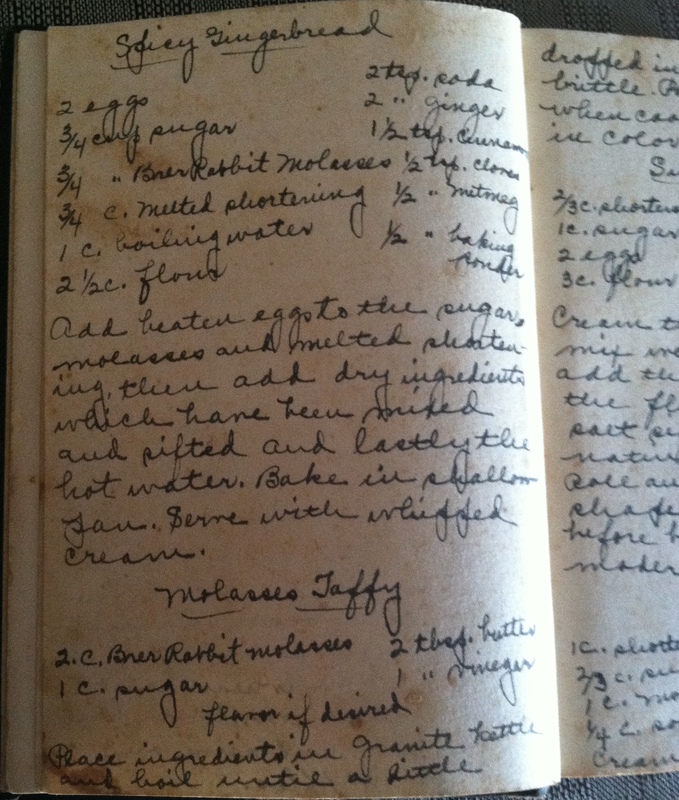 Handwritten recipe for Spicy Gingerbread from my grandmother’s tattered notebook. Scrape dough from sides of bowl and turn out on lightly floured surface. Quickly shape into a ball cover with a dry towel and allow to rest for 10 minutes. Knead dough for about 10 minutes, using only enough flour on the board to keep it from sticking. It is hard to estimate the amount needed, for flours vary in their ability to absorb liquid. When the dough is smooth and satiny, place it in a warm well-greased bowl and turn over, thus greasing all sides. Cover bowl with a clean kitchen towel wrung out in warm water, and set bowl in warm draft free space until dough is double in bulk. Punch down with your fist and gather dough into a ball to turn out on a lightly floured board surface. Knead dough for about two minutes. Cover dough with a dry towel and allow it to rest for 10 minutes. While dough is resting, grease baking pans with the butter or high-grade vegetable oil. Divide brown sugar topping between two pans. Add whole or chopped nuts for topping and set pans aside. Cut the dough in half and return one to the bowl and cover. Take the other half of the dough into a 14×19 inch rectangle. The dough should be about ¼ inch thick. Moisten the sugar free strip further from you lightly with water. With the moisten strip lightly to seal. Turn and roll over so seam is on the bottom. Stretch roll lightly and shape with the fingers until it is a cylindrical as possible. Cut roll crosswise into nine equal pieces, using a sharp thin bladed knife. Place pieces, cut, side down, in brown sugar and nut mixture, leaving space between each. Press tops gently with fingers so all are about the seam thickness. Repeat with the second half of dough. Cover pans with towel wrung out of warm water and set in warm draft free place until buns double in bulk. Bake in a preheated 350°F oven for about 35 minutes or until medium brown. Immediately turn pan over on baking sheet, leaving pan on top for about one minute, so the syrup can drain out on the cinnamon buns before it hardens. The bottom side of the roll mass is then the “top.” Allow to cool slightly before serving. Butter may be served with these buns if you desire. Use pecans and instead of syrup or honey, use ¾ cup of brown sugar and ¼ cup of softened sweet butter, creamed together until fluffy. Spread this in the bottom of greased pan and place pieces of rolled filled dough on top. Let rise and bake as above. Cinnamon buns are American adaptations of Cinnamon sweet breads, i.e. German Schnecken and Swedish Tea Rings. They are made in many ways, depending on where you happen to love or where you were raised, all are delicious. UX Researcher/ Service Design, Strategic Designer and design critic/writer plus I love making quirky felted and knitted objects. I luv everything Brazilian! This entry was posted on December 28, 2014 by chesronster in 2014, desserts, Recipe and tagged 2014, Apple Dumpling, Butter Scotch Pecan Rolls, Cinnamon buns, Michele Washington.